This post is a milestone of sorts. I’m writing to you today from Seattle, Washington. I guess that makes me a “blogger/correspondent.” Actually, the PRDude has published “travelogue” type of of posts before, most recently, a two-part blog on our March vacation visit to San Juan, PR. But this is my first “on-the-scene” chronicle. Also, this is my first visit to the Emerald City, and I’ve had a few days to make some observations. The Weather. Yes, it rains a lot here. Rained the first two days, but not much since. But the rain is a steady, almost gentle drizzle borne from some very low-hanging and slow-moving clouds that blow in from the west. 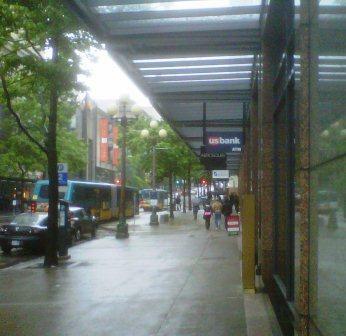 Seattleites don’t appear to be bothered; many forgo umbrellas and just wear hooded rain jackets. Unlike New York, where mysterious umbrella sellers appear at the first drop of rain, no one sells umbrellas on the street in Seattle. What they do have here that I’ve never seen elsewhere: Awnings that jut out from many of the newer buildings. Practical and ingenious. 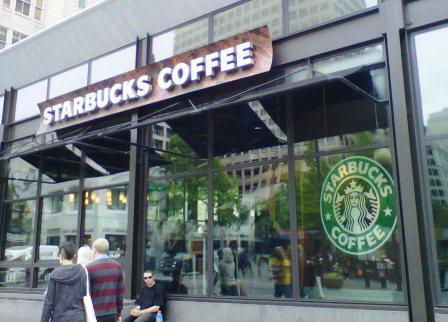 This is not the “first” Starbucks, but it’s an actual “Seattle” Starbucks. Downtown. 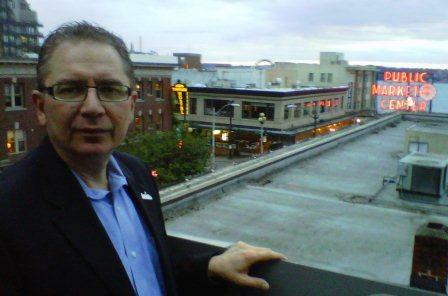 From our downtown business hotel, it’s apparent this place is fairly prosperous. The business district is fairly compact and comprised of handsome modern office towers and the requisite high and low-end chain restaurants and stores, along with some excellent local eateries and shops. That’s what successful enterprises in aviation, software and coffee will do to an economy. There’s a definite atmosphere here that whispers rather than shouts “Seattle!”; it gets magnified, however, when it rains. And, we didn’t see much litter or stifling traffic. Why don’t other cities have cool awnings like this? Coffee. Yes, they have lots of Starbucks, Seattle’s Best and other independent coffee shops here. We’ve visited a few. All serve really good coffee. Don’t believe Seattle invented the coffee shop concept, but they certainly institutionalized it. Unlike some cities, where there’s a Starbucks on every other block, here, there’s two Starbucks on every block. Water. Seattle has a lot of water, and not all of it falls from the sky. There’s the Puget Sound to the west and Lake Washington to the east. And, there are a lot of things to do on the water, like sail a boat. Didn’t see anyone swimming in the waters, thought. 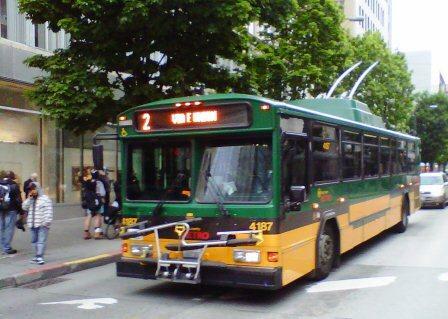 Wouldn’t you like to ride on one of these cool electric buses? Electric Buses. Seattle doesn’t have a major rapid transit network, like my native Chicago. But it does have something Chicago used to have — electric buses. I remember riding them as a kid and enjoyed the “woosh” kind of sound they made. Pike Place Market. I didn’t get to visit the Space Needle (or many other cool Seattle attractions like the Ballard neighborhood) but we did get to visit Pike Place Market, the famous venue that’s been around for decades. Saw the stand where the guys shout and throw fish around. Learned from a local that the market is much more than just fish, flowers and food. It’s a self-contained community, with more than just shops: Day care, market rent apartments, counseling for those in need. The PRDude with Pike Place Market in the distance. From a perception perspective, I think Seattle will rise from a place where it rains a lot and coffee is prevalent. There’s an energy here, even though Seattle’s most famous citizen may be Seattle Sutton. (Note: Perhaps they can benefit from an effective public relations campaign?) Some cities are places that “you should have visited 20 years ago.” Not Seattle. I’m glad I visited it and hope to return when I’m not working a convention. Have a safe and happy Independence Day, and hope we can visit soon.